The Irish FA is attempting to stop Kyle Lafferty playing for Rangers this weekend after invoking FIFA’s five-day rule. Lafferty was an 87th-minute substitute for Rangers five days before Northern Ireland faced Austria in the Nations League on October 12 and manager Michael O'Neill said the 31-year-old had called him later that night to explain he would not be travelling because of an Achilles injury. That meant he missed the defeat in Vienna and their 2-0 loss to Bosnia and Herzegovina in Sarajevo on Monday. The FIFA rule prevents players from representing their clubs for five days after an international break, if requested by the nation's governing body. That five-day period began on Tuesday, and the IFA informed Rangers that day. It means that Lafferty is set to be absent for Steven Gerrard's side as they travel to Hamilton on Sunday, live on Sky Sports. An Irish FA statement said: "The Irish FA has written to Rangers FC regarding Kyle Lafferty who was selected in the Northern Ireland squad for the UEFA Nations League matches against Austria and Bosnia & Herzegovina on 12 and 15 October 2018 respectively. "As the player did not comply with the Association's call-up, the player is in breach and as a result, the Association is invoking the FIFA regulation (FIFA Regulations for the status and transfer of players, Annexe 1, Section 5). "This states that 'the player is not entitled to play for the club with which he is registered during the period for which he has been released or should have been released pursuant to the provisions of this annexe. "'This restriction on playing for the club shall, moreover, be prolonged by five days in the event that the player, for whatsoever reason, did not wish to or was unable to comply with the call-up.'" 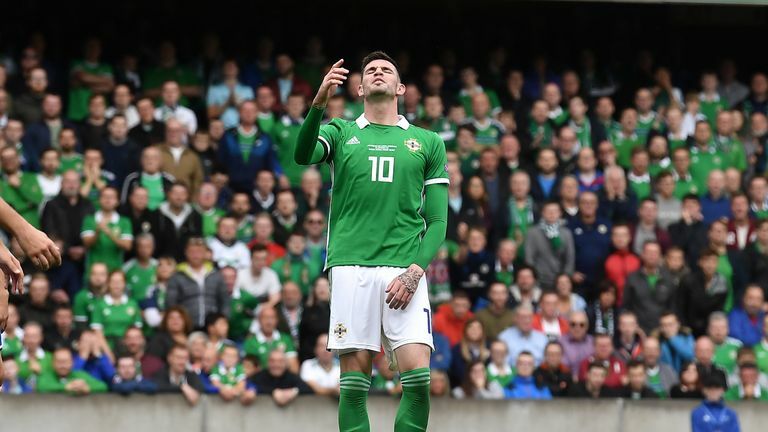 Lafferty last played for his country in their Nations League defeat to Bosnia and Herzegovina in September. Rangers are not commenting on the matter.